I’ve been at my current company for over a year now, and one of the first requests I received when my co-workers found out that I like to bake was for a peach cobbler. It’s important to note, that while I love baking, I have actually never baked a cobbler, until now. When it came time to boil and peel the peaches, I was definitely out of my element. Don’t worry I made it work, but be forewarned, peeling, coring and slicing peaches sounds easy peasy but when they are slippery and sliding every which way in your hand, it takes extreme concentration not to slice off the tip of your finger. Back to the recipe, I love the fact that this recipe calls for alone peach cooking time, the result is a rich, delicate peach filling that literally melts in your mouth. Pair those perfectly baked peaches with a not too sweet crust and a scoop of vanilla ice cream and you’ll never crave another dessert again. Seriously, this might be the best baked good I have ever made. 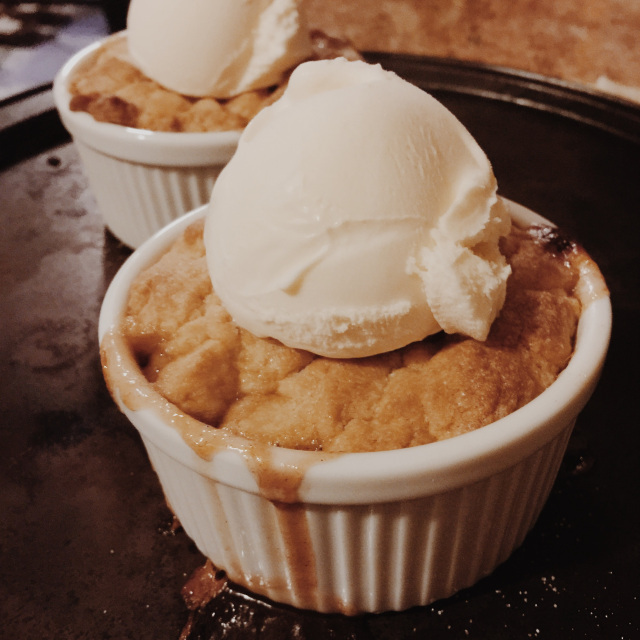 So good, I made individual ramekin cobblers a few days after bringing in a 9”x13” sized dish to work for a coworker’s birthday. Bring a large pot of water to a boil. Using a sharp paring knife make a small X on the bottom of the peach just through the skin. Drop the peaches into the boiling water one or two at a time for about 1 minute. Remove with a slotted spoon. Plunge peaches into a bowl filled with ice and water. Using the tip of the paring knife, grab the edge of the skin at the X and peel. Preheat oven to 400 degrees. In a large bowl, fold the peaches, 1/4 cup each white and brown sugars, cinnamon, nutmeg, lemon juice and cornstarch until all ingredients are well combined. Pour fruit mixture into a 9X13 inch baking dish. Place in preheated oven and bake for 10 minutes. While peaches are in the oven, add all the cake topping ingredients, except the boiling water, to a blender. Combine until the mixture looks like coarse meal. Pour in the boiling water and pulse until the mixture comes together and is just mixed through. After the peaches have baked the 10 minutes, pull them from the oven and drop large spoonfuls of the dough topping over peaches. Sprinkle the top of the dough with the 3 tablespoons of sugar evenly. Place the baking dish on a cookie sheet, in case the cobbler bubbles over and drips, and bake for 30 minutes or until the topping is golden and baked through and the peaches are tender.